In this dystopian American society, Kaylin stands out, even amongst others with similar powers. Her ability, to influence others, is highly sought after by warring factions. She’s been on the run with her best friend for years, but will her powers of empathy change all that? Where only teenagers have the ability to “push” others’ consciousness to do something or feel something, this society is set up much like other young adult dystopian novels. There’s the female main character who doesn’t know the reaches of her own power. There are the factions that want to use her for their own evil plans. 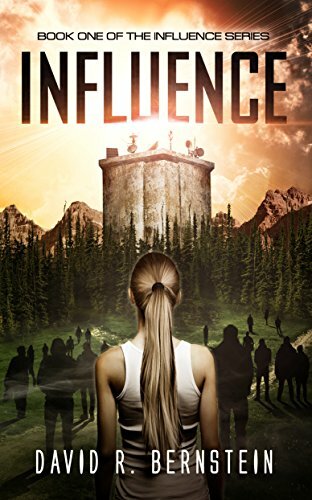 Where Influence is different is with its well-developed characters and satisfyingly detailed world building. I knew exactly how a “Push” worked and was shown many possibilities for how and why one would be used. I knew Kaylin and her best friend Amanda almost as well as they knew each other and loved how empathetic Kaylin was! Where the story lost me a bit was with the plot details and the romantic element. The sweet romance between kaylin and Farren was stereotypical for a dystopian teen read, but I enjoyed that even though this romance was based on mutual first attraction (duh!) that the romance grew slowly and steadily throughout the book and didn’t end with too much of the romance taking over the plot! The romance and action were well balanced. Some elements of the plot seemed a bit convenient and somewhat unexplained, but the book moved at a nice fast pace and kept me interested in the characters, their world, and their ultimate goal the entire time. The plot twist at the end was a bit rough and though all the elements to tie it in were there, they were a bit too loose for my liking. I loved the tease at the end and appreciated that this book contained both a full and satisfying ending while making the reader want to read more and find out what happens to Kaylin next! This novel was published by Amazon Digital Services LLC on August 15th, 2016 and is available on Amazon here.